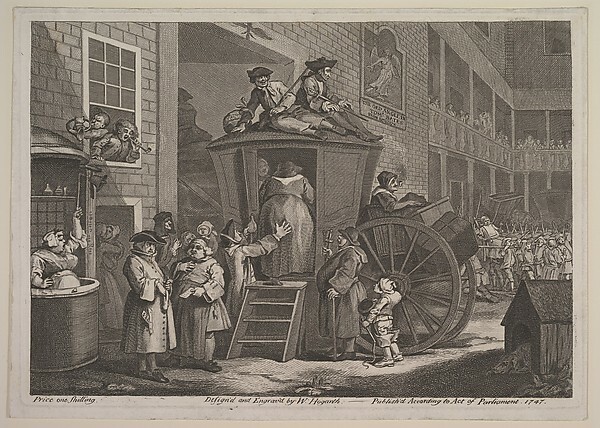 The Stage Coach, or Country Inn Yard, William Hogarth, 1747, Metropolitan Museum of Art. Hogarth, perhaps the most brilliant and prolific satirist of his time, returns! Departing from "The Old Angle" inn, a coach is loading with luggage and passengers. 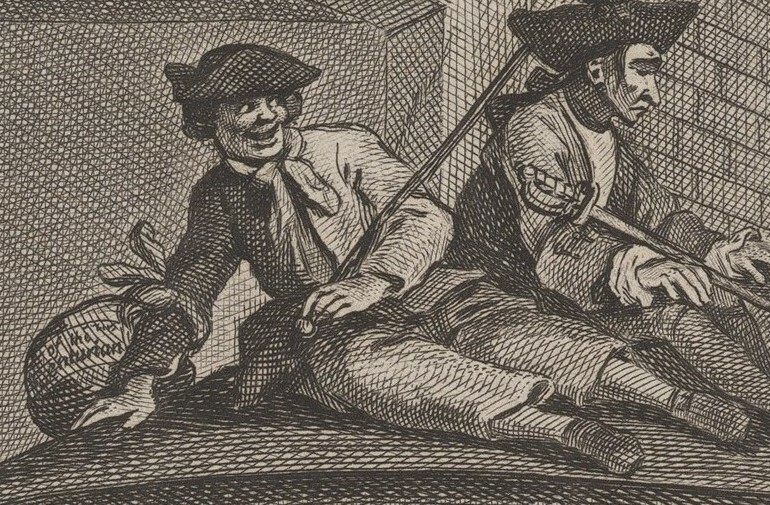 Hitching a ride on the roof is a dejected young gentleman clutching his sword. Beside him is a jolly tar. At his right arm is a bag with the name of his vessel: Centurion. A legendary fourth rate, Centurion was the only surviving vessel of the Anson expedition. The Centurion captured the Spanish treasure galleon Nuestra Señora de la Covadonga. Anson's victory ensured a huge sum of prize money for her sparse crew. In 1746 Centurion was again under Anson. She led the fleet to victory at the Battle of Cape Finisterre. No wonder Jack is looking so pleased with himself! He wears a simple black cocked hat with no tape or buttons, worn reversed with a bob wig. Our tar has knotted a large plain neckcloth about his neck. His jacket lays open, but Hogarth has not illustrated any buttons. The crosshatch shading of his cuffs suggest a mariner's cuff, but I cannot know. His trousers are plain, and end about the bottom of the calf. He wears white socks and square toed shoes. A trusty walking stick, complete with rounded metal head, rests across his left arm.